These are the adorable cards we made at our Memory Keepers Class this month!! 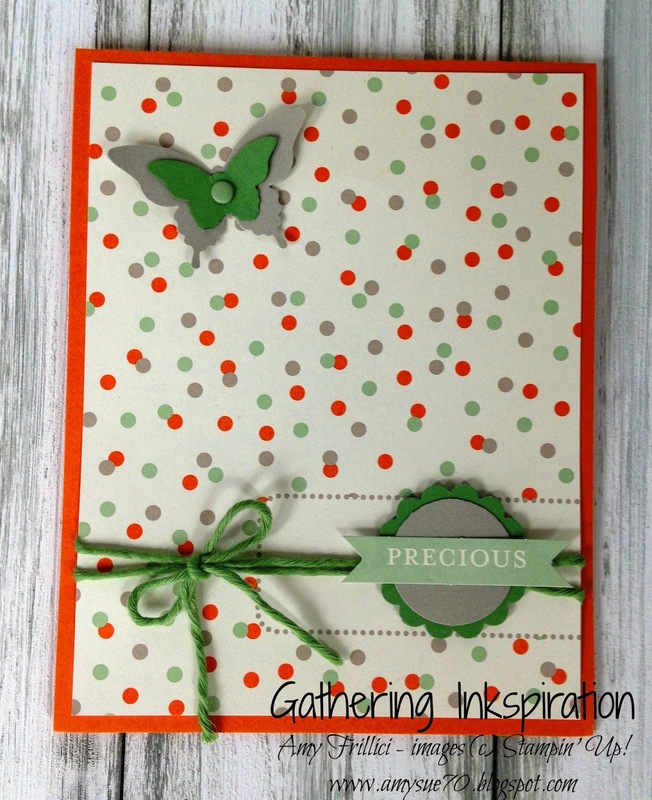 This simple card starts with a Sahara Sand card base, then we added that cute, gingham paper to the card. 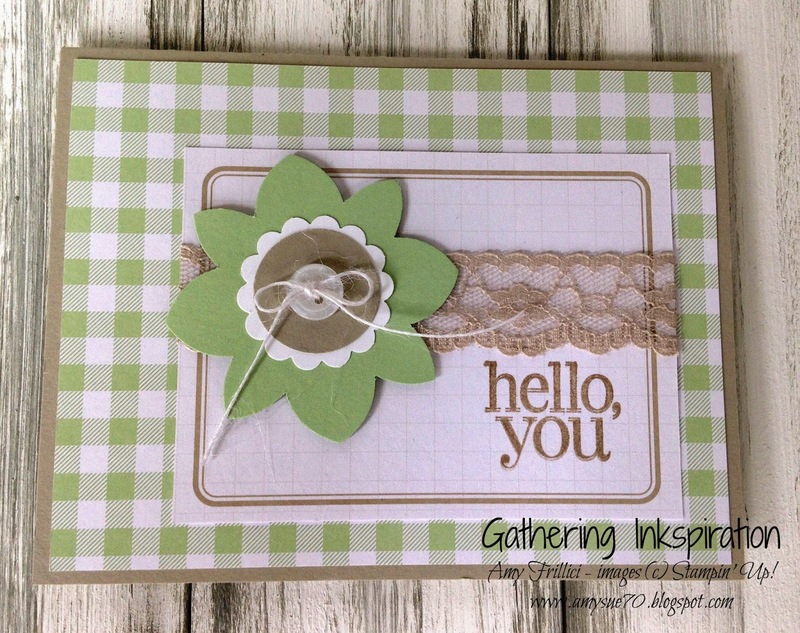 The gingham paper is one of the cards (trimmed down to 4 x 5 1/4") found in the Little Moments Project Life Card Collection. This card collection is on the retiring list - it's 50% off now and only available while supplies last!! 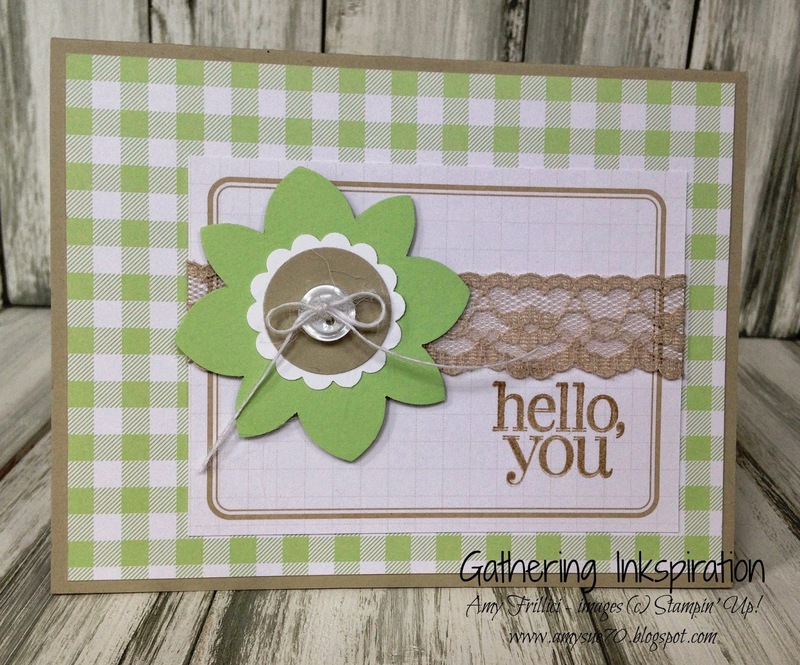 Next, we stamped "hello you" from the Regarding Dahlias stamp set in Sahara Sand ink on one of our smaller cards from our Little Moments Project Life Card Collection. This stamp set is also on the retiring list. This is one of my favorite stamp sets (check out that dahlia!) - I'm sad to see it go!! 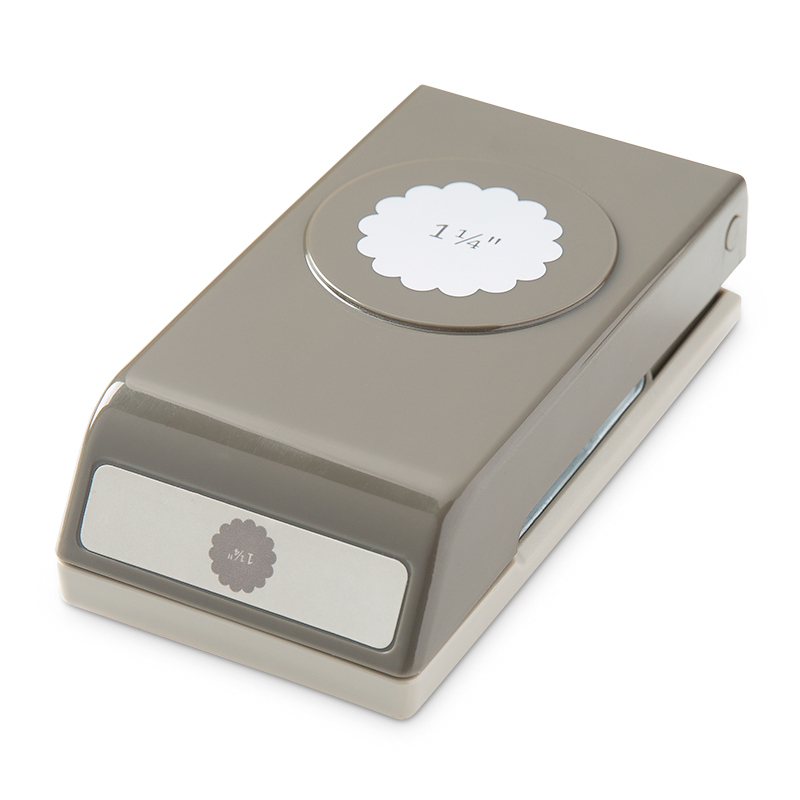 This particular card collection has a "baby" feel to it, but it can certainly be used for lots of other purposes (as seen on the card above!). Most of the cards in the collection have one side that is more generic than the other, so that you can customize it as needed! Next, we added a strip of Sahara Sand Lace Trim to the card (isn't it gorgeous?? 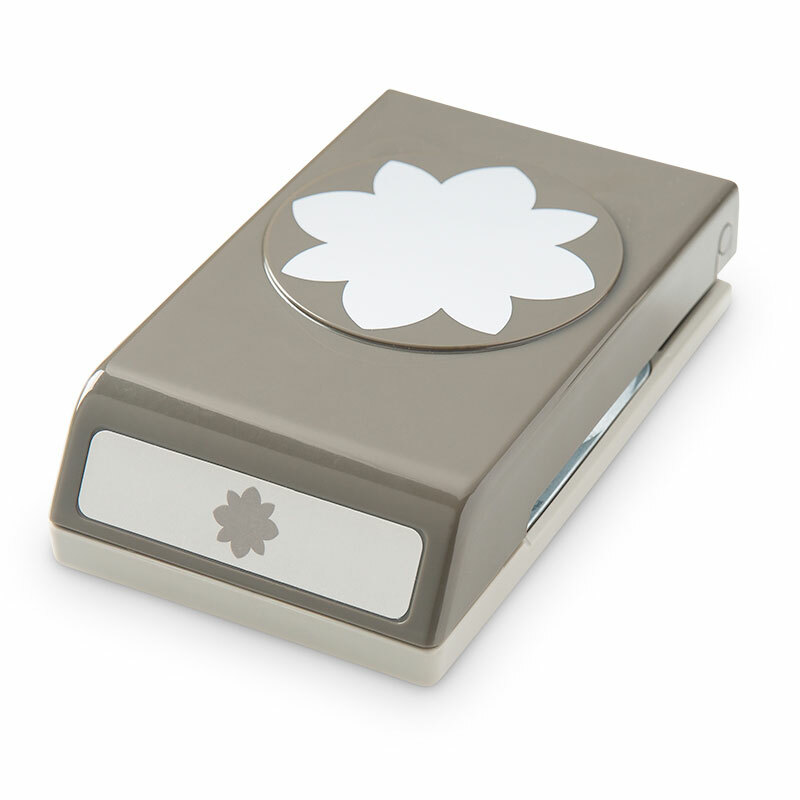 ), along with a Pistachio Pudding flower punched with the Flower Medallion Punch. We also punched a Whisper White 1 1/4" Scallop Circle punch and a 1" Sahara Sand Circle Punch and adhered them to the center of the flower. Finally, we added a Neutrals Collection Button (in Whisper White) tied with one of the strands from the White Jute Ribbon. 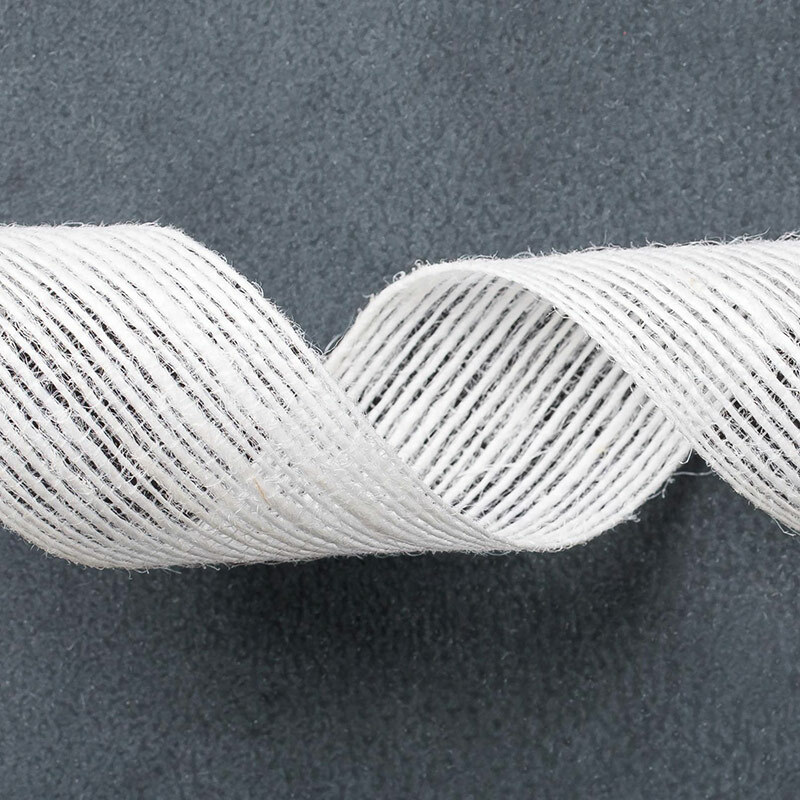 Check out the technique for making the strands of ribbon here. Our next card starts with a Pumpkin Pie card base, then we add another card from our Little Moments Project Life Card Collection (also trimmed down to 4 x 5 1/4"). We also added a bow tied with the super-soft Painted Blooms Cotton Twine around the card, along with that cute "precious" tag from the Little Moments Project Life Accessory Pack. This Accessory Pack comes with: embossed specialty cards, 8 vellum stickers, 2 die-cut elements sheets (including the "precious" tag), 12 wooden elements (see the cute diaper safety pin on the next below! ), 20 candy dots, 30 sequins and washi tape! This Accessory Pack is on the retiring list and is on sale for only $4.98 - it's only available while supplies last!! This "precious" tag is mounted on a Sahara Sand 1" Circle, which is mounted on a Wild Wasabi 1 1/4" Scallop Circle - too cute!! 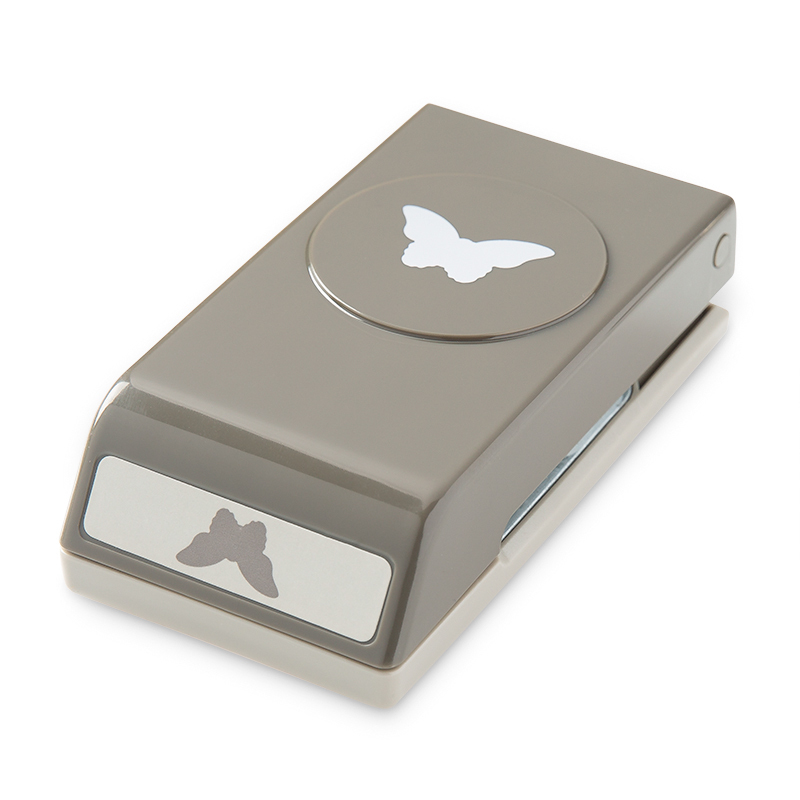 Finally, we punched a Sahara Sand Elegant Butterfly and a Wild Wasabi Bitty Butterfly and added them to the top of the card. A little Pistachio Pudding candy dot from the Accessory Pack is the finishing touch! 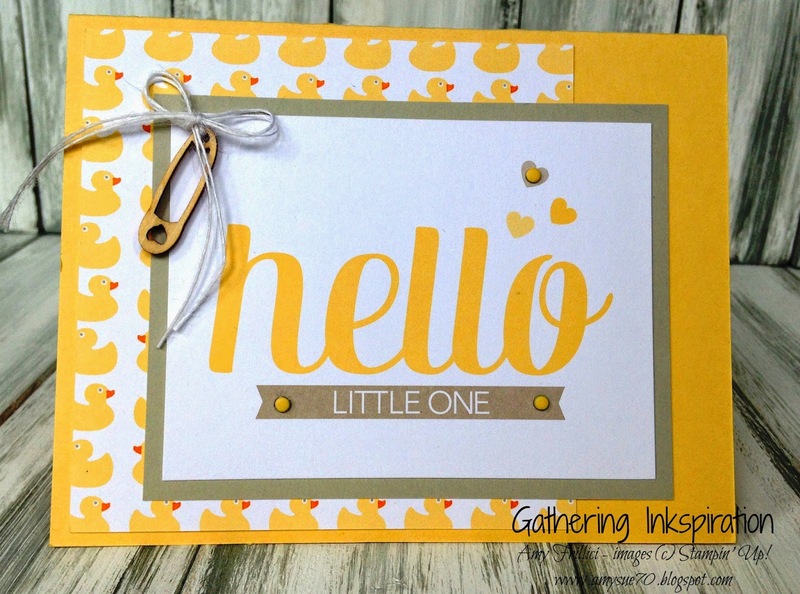 Our last card starts with a So Saffron Card Base, then we added those cute rubber duckies (from one of the cards in the Little Moments Card Collection). 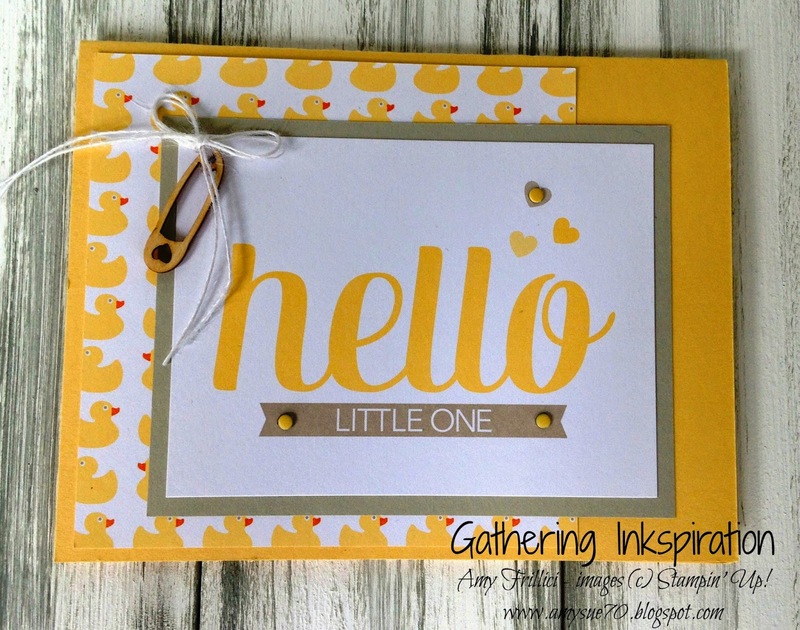 We also cut a Sahara Sand piece to layer behind the "hello little one" card, just to make it stand out a bit against the rubber duckies! Next, we tied some more of the strands of White Jute Ribbon through the diaper safety pin and added it to the card with Glue Dots. Finally, we added 3 mini candy dots to the card for our finishing touch!! These mini candy dots can be found in the Little Moments Project Life Accessory Pack. I hope you enjoyed these cards!! Thanks so much to Ronda Wade for her inspiration on these cards!! If you'd like to join us at our next Memory Keepers Class, we meet the 2nd to last Thursday of every month from 6-9pm. Check out all the details on this great class here! The next class meets on Thursday, May 21!! 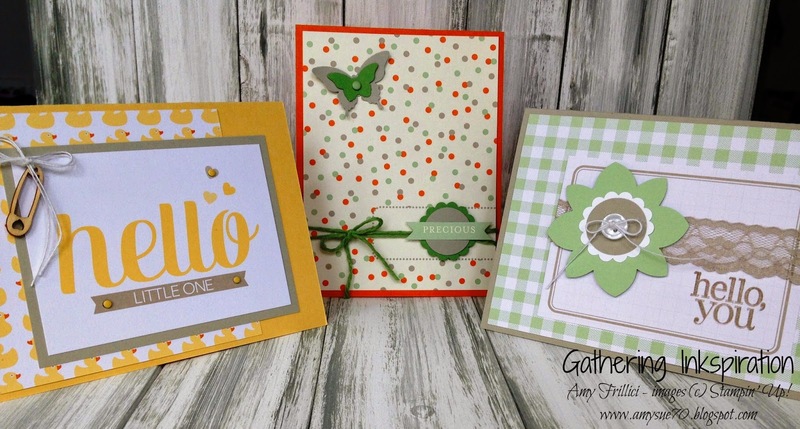 Posted by amy at 6:00 AM Labels: cards, memory keepers class, project life by stampin' up! Mini Treat Bags - Club Member Treats!! Cheerful Critters.... Way to Go! It's a Baby Dresser.... and a Card! !